All-in-one adjustable length strap attached to a heavy duty elastic cord system includes everything you need to tether your horse to the HiTie™ Arm. Halter clip on one end, hook and loop system on the other end, with a bungee cord between them. 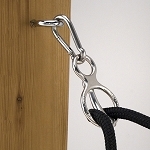 The hook & loop connection is designed to break free under heavy stress for horse safety. You can adjust the degree of tension and decide at what point you want the hook & loop connection to come open & free the horse, in case of emergency.